I'm back at our little farm from my fast and furious trip to Madison. The purpose of my trip was to teach a couple of classes and speak to the Madison Knitting Guild. I don't travel much - in fact barely at all anymore. But as I told my students at the guild, the Program Chair Barbara Rottman (who is now the President of the MKG) was tenacious at bugging me to come and speak. It was a long way and several flights and two full days traveling. I can't say I am wanting to go away again anytime soon. That said, I had a great trip. Mary Jo, the new Program Chair picked me up from the little friendly airport. I was there early enough for a fantastic tour of Madison. What a beautiful small city (233,000 people). It is a popular place for people to retire to. The Capital is beautiful and the location between 2 lakes is awesome. Barbara drove me all through the University of Wisconsin. What a school - clean, well maintained, beautiful architecture. Madison sits snuggled between two huge lakes and the school sits right next to one of them. There are 43,000 students. Funny thing is I had applied and was accepted to the University of Wisconsin when I was going to Graduate School for Textiles. I chose Colorado State because they gave me a better financial package and a paying job. I think I would have loved Wisconsin - although I loved CSU too. Barbara drove me past the School of Human Ecology where I would have gone. 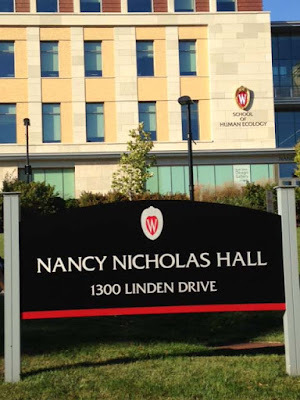 I was in hysterics because the building was named Nancy Nicholas Hall. That is the name of my Mom and Sister No. 4. How funny. 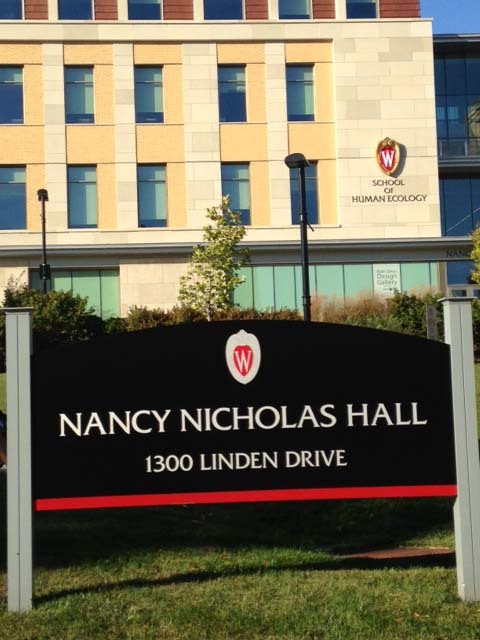 NO - it is not named for my mom but named after Wisconsin alum Nancy Nicholas who is the wife of Ab Nicholas - founder of The Nicholas Fund. But I had to take the photo anyway. I didn't bring too many samples with me because of the baggage weight restrictions. 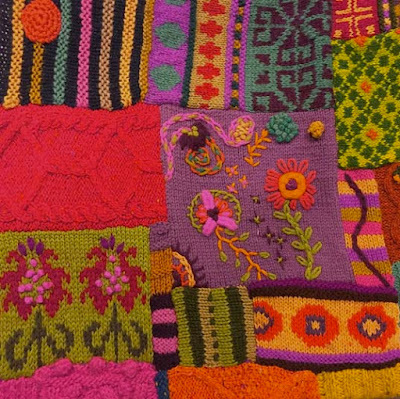 I did drag along my double bed size Swatch Blanket from my new book Crafting a Colorful Home. It was a hit. Here is Susan's photo of a detail from it. 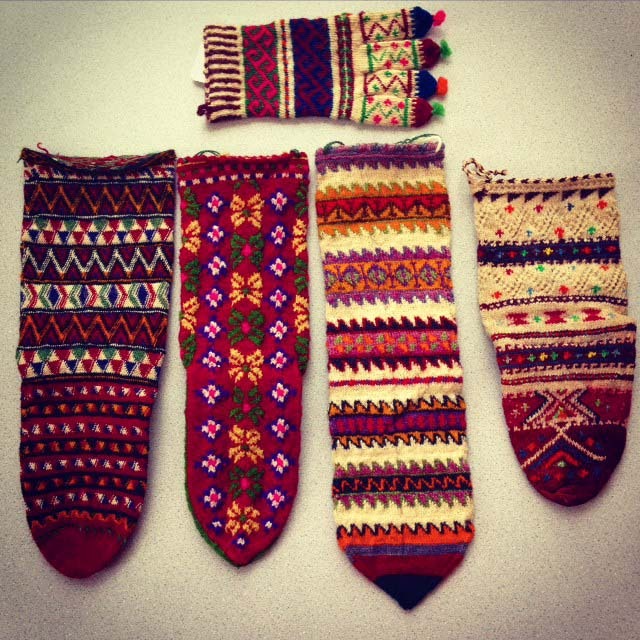 One of my students - I think her name was Rae - brought her collection of Turkish Wool Socks to show me. These knit samples were stiff as a board and made from very coarse handspun wool. They were so finely knit - probably 10 sts/inch. She is lucky she bought them when she did a few decades ago. I doubt textiles like this are easily available anymore. Gorgeous - thanks for sharing with all of us Rae. After a quick bite to eat - where I got a chance to try Wisconsin's famous Cheese Curds - I headed back to the Promega Biopharmeceutical Technology Center where the guild meets. What a fantastic facility they are able to rent because of their non-profit status. The street was packed with cars and inside stores had selling booths set up. 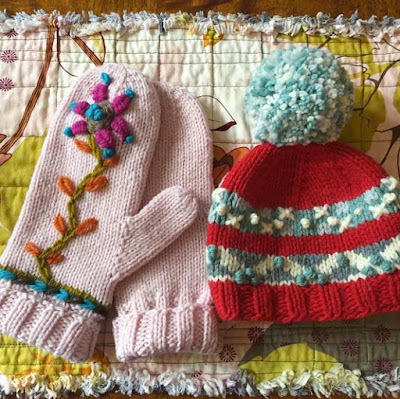 The Madison Knitting Guild has many charitable activities that it does every year including a program for knitting hats, mittens, etc to give to homeless shelters and others who might need warm things. Here is Ada (who was in one of my classes) and another member with the enormous pile of handknits that were brought in that evening. Amazingly generous knitters. After all the "Pre" activities, the meeting convened. 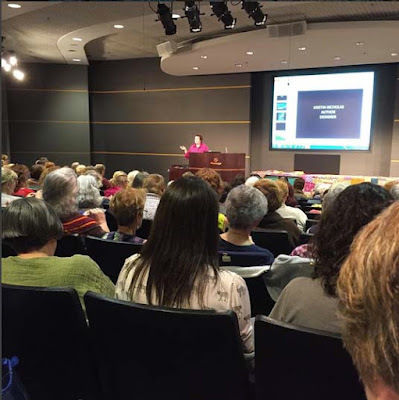 The auditorium was packed with about 300 knitters. Yikes! I was hoping I didn't disappoint. The talk went well and after it, many knitters who have followed my career for many years came up to chat. It was a fun night and I hope I opened some of their eyes to the possibilities of color, design, and art. Thanks so much for inviting me Madison Knitting Guild. What wonderful, enthusiastic knitters and people. Now it is back to normal life and getting a good chunk of work done. Is there anyway you could take more pictures of this swatch quilt? Closeup and any other way you can think of. I swatch a lot and have been thinking about doing the same thing. I really wish I could have been in Madison for your talk! I am from Madison and a proud graduate of the School of Human Ecology with a degree in Textile & Apparel Design. I also have a degree from FIT as well. I can honestly say I think you would have loved studying at Madison! Our campus is wonderful as is our city :) I hope you enjoyed the cheese curds! Loved seeing you there and really enjoyed your talk and photos. I look forward to your new episodes of K&C now. I moved here when I retired to be close to my son and his family. Used to live in New England. They are both great parts of the country. Thanks for spending time with us. And I love those SOCKS. - Thank you, NATALIA and RAE for carrying on and preserving the ART! Thanks so much for coming to Madison. I'm glad you enjoyed our city because we loved having you as our guest. I wish schools did have Columbus Day off so I could have attended your classes. 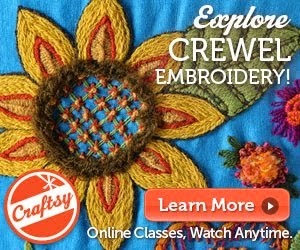 I would love to see more pictures of your swatch quilt. 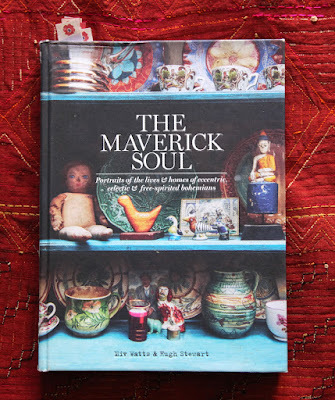 In your book a red blanket/tablecloth covered in embroidery appears in several pictures, too. I'd love to see more photos of that, too. Such gorgeous colors! That sounds like an epic trip - really interesting to hear about all the different places. That's a big crowd to talk to - well done - good to get out and spread the colourful world of Kristen! Enjoy your Autumn/Fall - I just love being surrounded by all these inspiring colours - it's my favourite season! 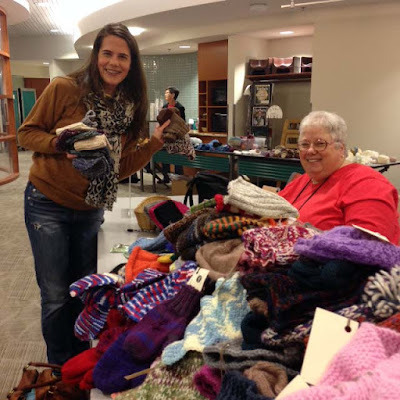 Kristin, your visit and classes were a highlight for Madison knitters. Thank you for the generously kind comments about our beautiful city and guild. Reading your summary opens a "window" into why you are such an innovative designer -- you don't miss a single detail, no matter how small, obscure or understated. Your ingenious designs, bold use of color and embellishment glimmer with these abundant details. Lesson for all of us to learn: pay attention! Thanks again, Kristin.